The runaway New York Times bestseller with more than 500,000 copies sold. 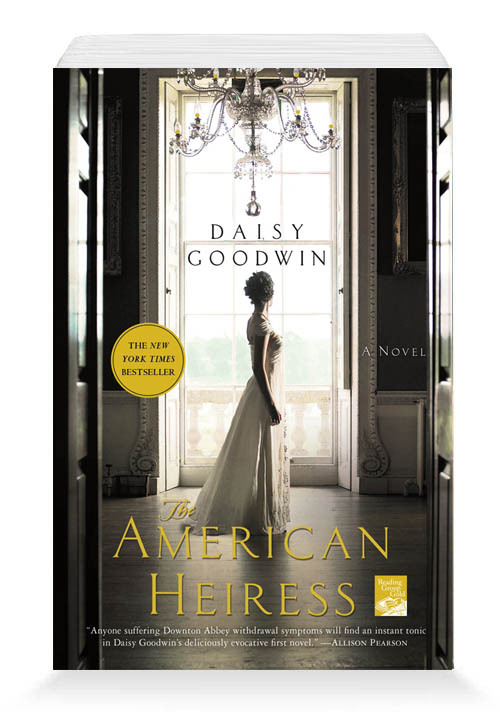 Enter a world in which American millionaires marry British aristocrats—in return for title and social status—and discover why this blockbuster bestselling novel continues to enchant millions of readers. What role do the mothers in the story—Mrs. Cash, Mrs. Van Der Leyden, and the Double Duchess—play in the central characters’ lives? Cora is always aware that “no one was unaffected by the money.” How does the money affect Cora herself ? What are the pleasures and perils of great wealth? When she was chair of the Orange Prize for Fiction in 2010, Daisy Goodwin wrote a controversial essay lamenting the “unrelenting grimness” of so many of the novels and pointing out that “generally great fiction contains light and shade”—not only misery but joy and humor. What do you think about Daisy’s argument that “it is time for publishers to stop treating literary fiction as the novelistic equivalent of cod-liver oil: if it’s nasty it must be good for you”? Kirkus Reviews called The American Heiress a “shrewd, spirited historical romance with flavors of Edith Wharton, Daphne du Maurier, and Jane Austen.” Other critics have also seen echoes of Henry James. If you have read any of these earlier novelists, what parallels and differences do you see in Daisy’s work?